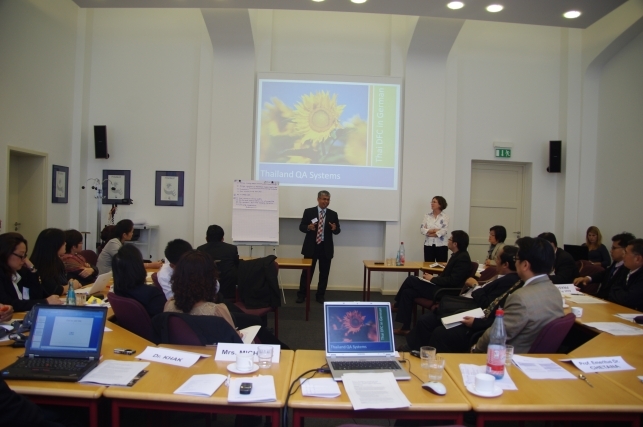 “Thai Deans for Change” was the theme of a study visit by 30 deans from Thailand to Berlin and Potsdam from 10th to 16th June, 2012. The Thai Deans for Change Programme is a cooperation of DAAD and HRK and the Knowledge Network Institute of Thailand (KNIT) and the German Centre for Higher Education (CHE). The programme provides an excellent platform to share examples of good practice in the field of higher education and professional management of universities. The deans took the opportunity to visit the University of Potsdam on Thursday, 14th June. Quality Assurance plays an important role at Potsdam University, as Dr. Philipp Pohlenz, Managing Director at the Centre for Quality Development, presented in a case study. Afterwards, the deans vividly discussed criteria for improving quality in teaching and learning in a workshop. Obviously, not every criterion was regarded compatible with every university in Thailand. The day ended with a presentation by Marc Wilde, head of section Joint Higher Education Management Programme (DIES) at DAAD. This presentation dealt with opportunities for cooperation between DAAD and Southeast Asian Countries. Of course, the ASEAN-QA project was a big part of this presentation and everybody agreed on its profit for the future of higher education quality in Southeast Asia. 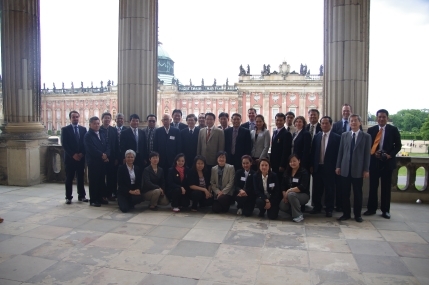 ASEAN-QA is coordinated and conducted by the University of Potsdam (Center for Quality Development in Higher Education - ZfQ) within the frame of the DIES programme, which is jointly coordinated by the German Academic Exchange Service (DAAD) and the German Rectors’ Conference (HRK). Partners of the ASEAN-QA Project are the ASEAN University Network (AUN), the Regional Centre for Higher Education and Development in Southeast Asia (SEAMEO RIHED) and two regional networks of QA agencies: in Europe and Southeast Asia: the European Association for Quality Assurance in Higher Education (ENQA) and the ASEAN Quality Assurance Network (AQAN).